transfer of oxygen into reaction areas. Many materials in our environment, including wood products, burn “indirectly” in the sense that the materials do not actually burn, but combustion takes place as a reaction between oxygen and the gases released from a material (an exception from this rule is the glowing combustion of charred wood where oxygen reacts directly with carbon). Under the influence of heat, wood produces easily substances that react eagerly with oxygen, leading to the high propensity of wood to ignite and burn. Ignition and combustion of wood is mainly based on the pyrolysis (i.e. thermal decomposition) of cellulose and the reactions of pyrolysis products with each other and with gases in the air, mainly oxygen. When temperature increases, cellulose starts to pyrolyse. The decomposition products either remain inside the material or are released as gases. Gaseous substances react with each other and oxygen, releasing a large amount of heat that further induces pyrolysis and combustion reactions. Pyrolysis and burning processes are illustrated in Figure 1. Figure 1. A schematic picture of pyrolysis and combustion of wood: a) External heating increases the temperature of wood. b) Pyrolysis starts and the chemical structure of wood is decomposed. Light pyrolysis products volatilize from the surface. c) Combustion starts. Pyrolysis products react with oxygen and produce more heat, causing a strongly growing chain reaction. Depending on environmental conditions (such as temperature, oxygen concentration, moisture, fire retardants, pH etc. ), the pyrolysis of wood can proceed mainly on two pathways presented in Figure 2a. The tar forming pathway, taking place in a temperature of approximately 300 °C, is related to the “normal” burning of wood. In this case, pyrolysis produces a lot of tar including levoglucosan that decomposes easily into burning gases under the influence of heat (see Figure 2b). Thermal decomposition can take place also through char forming pathway. In this process, cellulose is first transformed to unstable, “active” cellulose that further decomposes so that reaction products are mainly carbon dioxide and water, and the “backbone” of cellulose containing a lot of carbon (see Figure 2c). 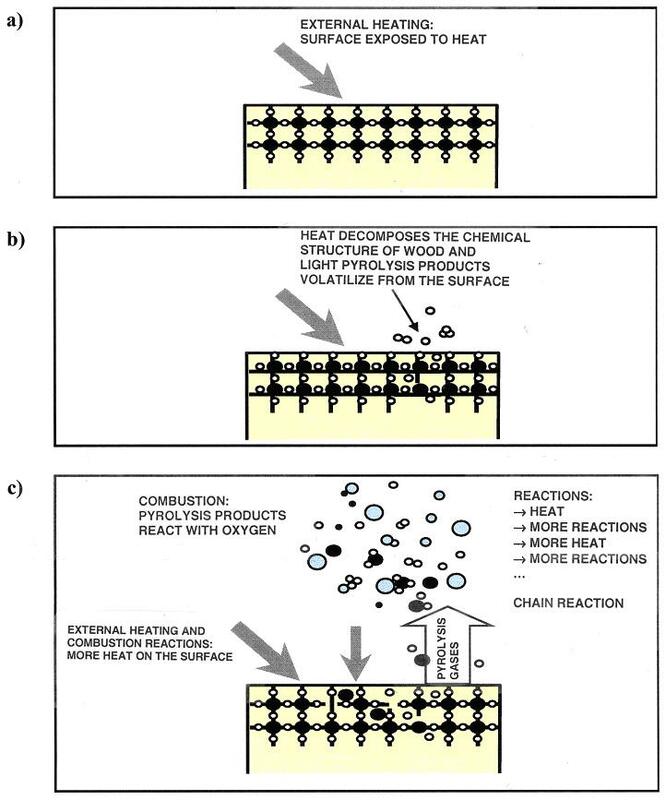 Figure 2. a) The two main reaction pathways of thermal decomposition of wood. b) Splitting of cellulose molecules in the tar-forming reaction (normal combustion). c) Splitting of cellulose molecules in the char-forming reaction. The pyrolysis of wood is dependent on external factors, such as the way of heating, warming-up rate of the material, etc. Therefore, wood products do not have an explicit ignition temperature, but ignition takes place on a certain temperature range where the probability of ignition becomes large enough. The temperature for the piloted ignition of wood is typically about 350 °C, whereas the spontaneous ignition requires a temperature of approximately 600 °C. The reaction-to-fire properties, such as ignitability, heat release and flame spread, are most relevant for fire retardant wood products. Charring as a fire resistance characteristic property may also be influenced especially by surface protective layers. In order that wood can ignite, its temperature must rise so high that pyrolysis takes place strongly enough and the chemical reactions of combustion start. Therefore, the ignition of a wood product is dependent on the way of heating, that is, the thermal properties of the material, and the way of heat attack on the material. The factors affecting the ignition of wood are well known in general: wet wood is difficult to ignite, thin pieces of wood ignite more easily than thick logs, and light wood species ignite quicker than heavy species. External factors having an influence on ignition are the intensity of heat exposure and its form of effect (e.g. the distance of flames from the surface). The moisture content of wood has an effect on ignition mainly as a heat sink. Heating-up of the water and especially its vaporization consume heat energy. In addition, moisture increases the thermal inertia of the material. The ignition of wood products with different thicknesses is dependent on their thermal thickness. A thermally thin layer ignites more quickly than a thermally thick material. When a thermally thin product is exposed to heat on one side, its opposite side heats up very close to the temperature of the exposed side by the time to ignition. In the case of a thermally thick product, the opposite side does not heat up but remains at the ambient temperature when the specimen ignites. The thermal thicknesses of practical products fall between thermally thin and thick. As a rule of thumb, a wooden product is thermally thin if its thickness is not more than a few millimetres, and thermally thick if its thickness is of the order of 10 mm or more. where ρ, c and k are the density, specific heat and thermal conductivity of the material, respectively, L0 is the specimen thickness, Tig; is the ignition temperature, T0 is the ambient temperature, and is the net heat flux to the specimen surface. When the thermal thickness of the product is between thermally thin and thick, the exponent describing the effect of the net heat flux q" net and the temperature difference Tig – T0 is between 1 and 2. Heat released in combustion is the driving force of a fire: the larger the heat released by a burning object is, the faster the fire spreads and the hotter the gases and limiting surfaces of the fire enclosure become. Thus, one of the most essential quantities describing the burning of materials is the rate of heat release, denoted with and expressed in kW or MW. where Tig is the ignition temperature and T0 is the ambient temperature. It is noted that, in addition to the incoming heat flux on the surface, is also dependent on the heat losses from the surface. The rate of heat release per unit area can be measured for example using the cone calorimeter  that describes burning in a well ventilated environment (the early stage of a fire). The results obtained describe the heat release properties of materials, though they are to some extent dependent on the heat exposure level used in the test, the properties of the exposed surface (in the case of wood, e.g. grains, knots and tendency to crack), and the specimen thickness. When wood burns, flames spread on its surface. Flame spread can be regarded as a sequence of ignitions. Therefore, flame spread is governed by the same factors as ignition. The heat released by a burning area has an effect on flame spread rate, directly by the flames and through the warming-up of the fire enclosure. Thus, the factors governing the rate of heat release are essential also for the flame spread. When a wood product burns at a constant rate of heat release per unit area, the boundary between the pyrolysed material and the intact wood, i.e. the pyrolysis front, proceeds to the wood in depth direction. Since all pyrolysing wood can be considered to char, the charring rate β corresponds to the propagation rate of the pyrolysis front. Charring rate is an essential quantity for the fire resistance of wooden structures, because the wood under the char layer preserves its original properties. Important factors for the charring rate of wood are the density ρ, the external heat flux , and the moisture content w . Charring rate decreases with increasing density according to the power law where υ is between 0.5 and 1 (υ = 0.5 results from studying only heat transfer and υ = 1 corresponds to a model covering only the conservation of mass). Charring rate increases linearly with the external heat flux, . An approximate relationship between charring rate and moisture content is . A typical value of the charring rate of wood is approximately 0.5 - 1 mm/min. Table 3 shows design values of charring rate for various wood products as presented in the European design standards EN 1995-1-2 [22,23]. Charring rate is not generally much influenced by fire retardants . However, the char yield is usually increased quite a lot, that might contribute to the protection of the wood core. Protective coatings may generally be efficient in preventing ignition and charring of wood. Table 3. Design charring rates for wood products . Symbols: ρk = characteristic density, d = thickness, β0 = design charring rate for one-dimensional charring under standard fire exposure, βn = design notional charring rate under standard fire exposure. Smoke formed during a fire consists of small, mainly carbon containing particles that reduce the visibility. High smoke production in the early phases of a fire is very harmful considering the fire safety of buildings, because it endangers emergency egress through the reduction of visibility and the irritating and incapacitating effects of smoke gases. Smoke production is dependent on the burning material, but also external factors, such as fire type (flaming / smouldering) and oxygen supply, are important. Compared to plastics, the smoke production of wood products is minor. In well ventilated conditions, the smoke production of wood is typically about 25–100 m2/kg, whereas plastic products release hundreds or thousands m2/kg of smoke. A common assumption is that fire retardants increase the smoke production of wood. This may be the case, since fire retardants may cause incomplete combustion, but a fire retardant can also reduce the smoke production. The proverb “no smoke without fire” holds true: if a fire retardant treatment hinders burning well enough, smoke production is also reduced. The main products of combustion are carbon dioxide and water, but also other chemical compounds can be released. If these compounds are toxic, they impede the egress of occupants from a burning building. The main cause of intoxication in fires is carbon monoxide (CO). It is the dominating toxic combustion product from burning wood. The formation of CO is strongly dependent on ventilation: well-ventilated combustion produces considerably less CO (less than 10 g/ kg of burning material) than oxygen-controlled burning where CO production is of the order of 100 g/kg of burning material. Also the temperature is a significant factor, because it has a strong effect on the course of the chemical reactions in combustion. The production of toxic gases by wood products with improved fire performance is dependent on the substances used as fire retardants. Therefore, it is necessary to monitor possible toxic combustion products and keep their release well within acceptable limits.